HANCOCK — For the Marquette Blues American Legion baseball team, 2018 is supposed to be a rebuilding season. 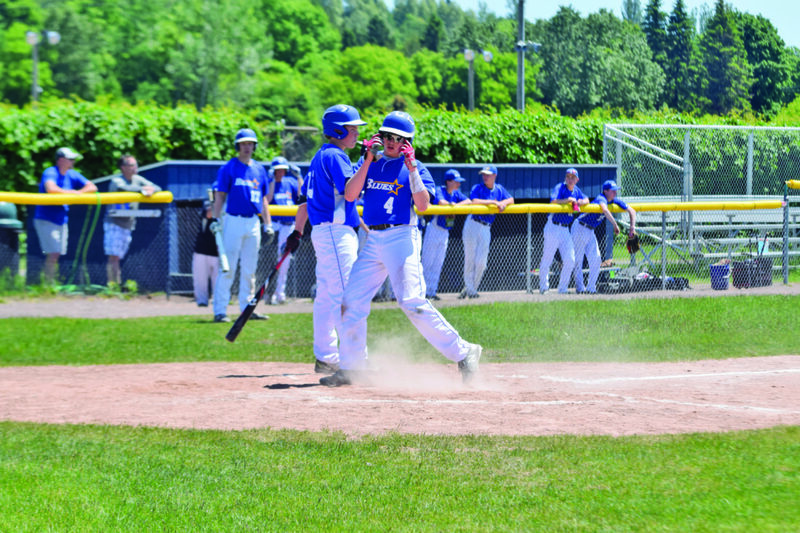 Four games into the campaign, however, the Blues are 4-0 thanks to a recent sweep of Iron Mountain and a sweep of the Copper Country Flames Post 186 on Sunday. In both of Sunday’s doubleheader, the Blues jumped out to a sizable lead early. The lead held up in the opener, 8-6, but the nightcap saw the Blues score five in the final inning to turn a 6-5 deficit into a 10-6 victory at the Hancock Driving Park. It may not have been how manager Derek Swajanen would have scripted things, but he is happy with the end result. For the Flames, the warm, windy day saw a multitude of errors, but also some really smart plays that had them within striking distance in both contests. The Blues fielded a roster with a number of young faces while the Flames were missing three players who had played in a high school regional tournament on Saturday and had three other players in the lineup who did not see live pitching in the spring. While neither team was happy with the way a number of plays went, both found bright spots. The Blues jumped out to a 4-0 lead in the second inning of the opener and eventually pushed that advantage to 8-3 after six. That’s when the wheels nearly fell off as starter Blake Henriksen, who had struck out 11 over six innings, came out of the game and Alec Gadzinski took the mound. In the bottom of the seventh, the Flames’ rally started with a single to center from Eli Oldt. He advanced into scoring position on a sacrifice bunt from Tyler Turcotte. Kevin Bostwick then singled to left field. Brody Budweg was hit by a pitch and suddenly the Flames had the bases loaded. Justin Norkol laid down a suicide squeeze, but he reached on a collection of misplays, including a collision between the Blues’ Connor Steer and Peter VandenAvond. Three runs scored on the play, pulling the Flames within two. Logan Fish followed, reaching base on an error that allowed him to get to second. Fortunately for the visitors, that was as close as the Flames would get as Patrick Cortright grounded out to end the game. Manager Cortright was pleased with the effort his team showed in fighting back. CC pitcher Carter Crouch, who struggled early with his control, got stronger as the game went along, going five innings and racking up six strikeouts. In the nightcap, the Blues jumped on Bostwick early, scoring four runs in the first, thanks in part to a two-run double from Hunter Doucette. Doucette later scored during a double play. The Flames clawed their way back into the game, trailing 5-2 heading into the bottom of the fourth. They were able to put up four runs in that half inning. Crouch opened with a triple to the rightfield fence. Patrick Cortright followed with a double to left center, scoring Crouch. Doucette took the mound for the Blues at that point, but things continue to go the Flames’ way as Brett Lepisto reached on an error. Cortright scored on the play. Oldt and Turcotte walked. Bostwick attempted a bunt, but Lepisto was tagged while heading for home. Budweg hit a sacrifice fly that brought Oldt home. Norkol then singled to bring Turcotte home, giving the Flames their first lead of the season, 6-5. Bostwick continued to settle in on the mound until the top of the sixth, when the Blues loaded the bases for Doucette. On 2-1 count, Doucette turned on an offering and drilled a doubled home two runs, giving the Blues back the lead. Marquette added three more runs before a tag at second ended the inning. The Flames threatened in the bottom of the sixth when Bostwick doubled to left field and Budweg was hit by a pitch. Unfortunately for the hosts, Norkol hit into a double play, ending the game.